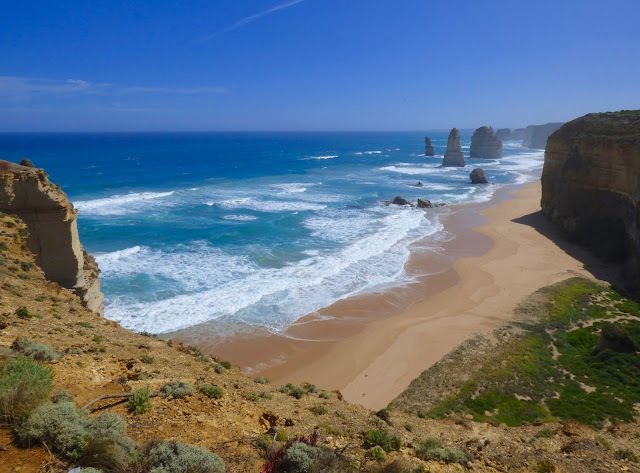 "The Great Ocean Road is an Australian National Heritage site -- 243 kilometres (151 mi) stretch of road along the south-eastern coast of Australia," intones Wikipedia. 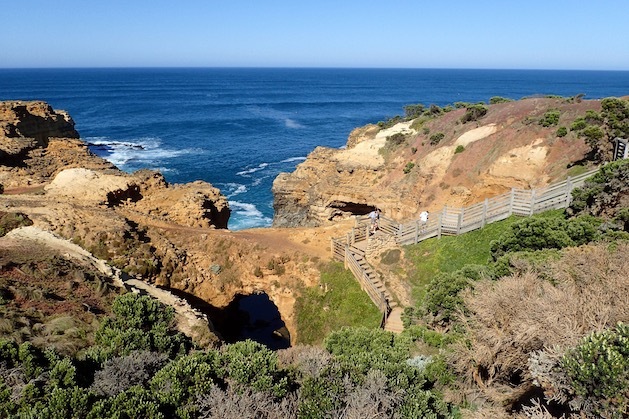 Ocean viewpoint, Great Ocean Road, by Split Point lighthouse. Victoria, Australia. Twelve Apostles viewpoint, looking South. 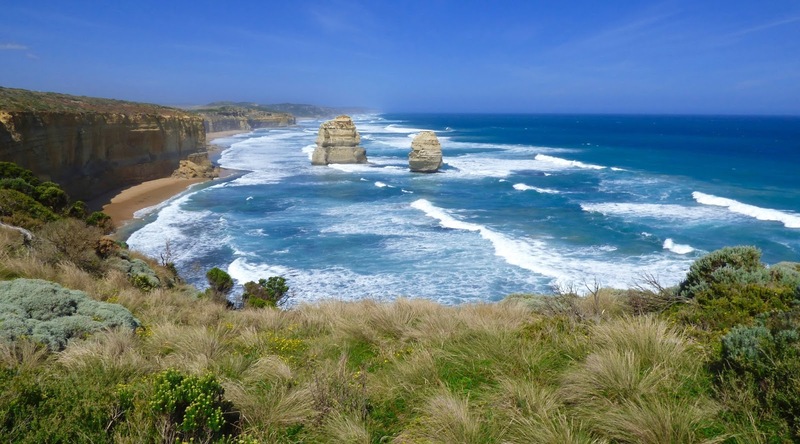 Great Ocean Road, Australia. 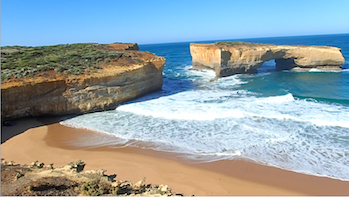 Best territorial viewpoint for the 12 Apostles on the Great Ocean Road, Australia – if the crowds weren’t there! Yup, that's the same place alright. Twelve Apostles viewpoint, looking North. Great Ocean Road, Australia. 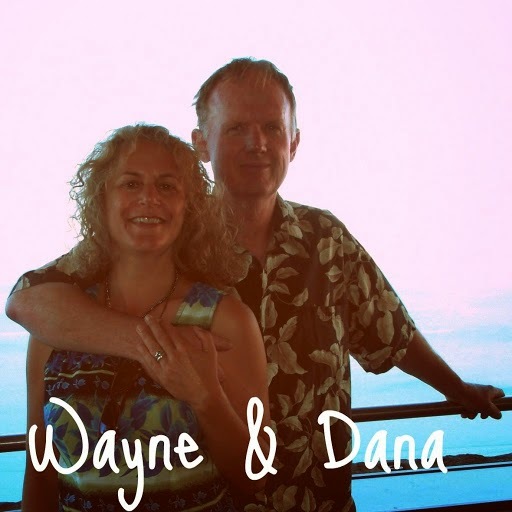 Andrew makes travel suggestions; Wayne marks them into our Camps 8 book. Laver Hill, Great Ocean Road, Australia. 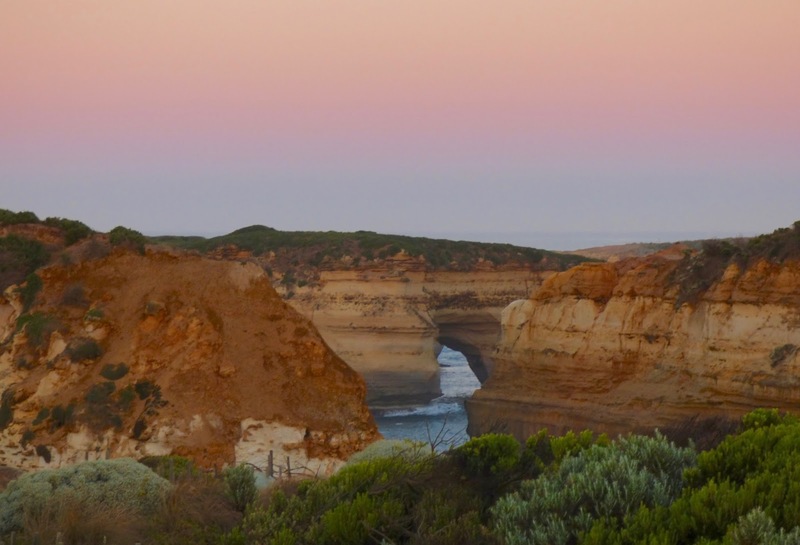 Uncrowded Loch Ard Gorge, painted in dawn’s gentle pastels. Great Ocean Road, Australia. 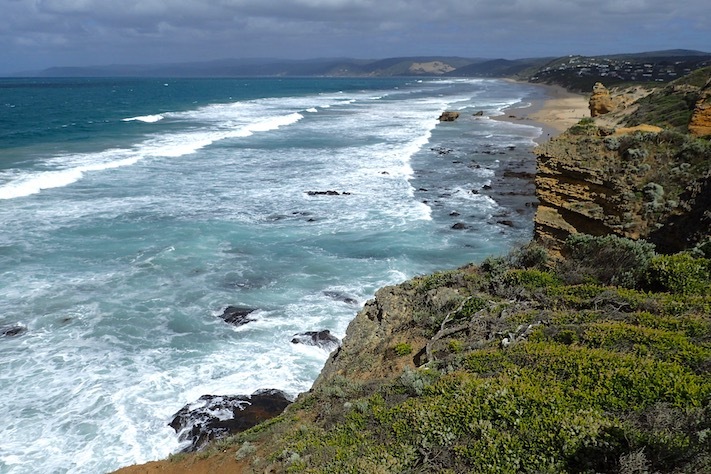 The Great Ocean Road showcases some magnificent Australian coastline. The 12 Apostles (well -- what's left of them -- 7 or so) justifiably garners oodles press and thus attracts hordes of international tourists. There were many worthwhile places to stop and take the vistas in, and we stopped at many. 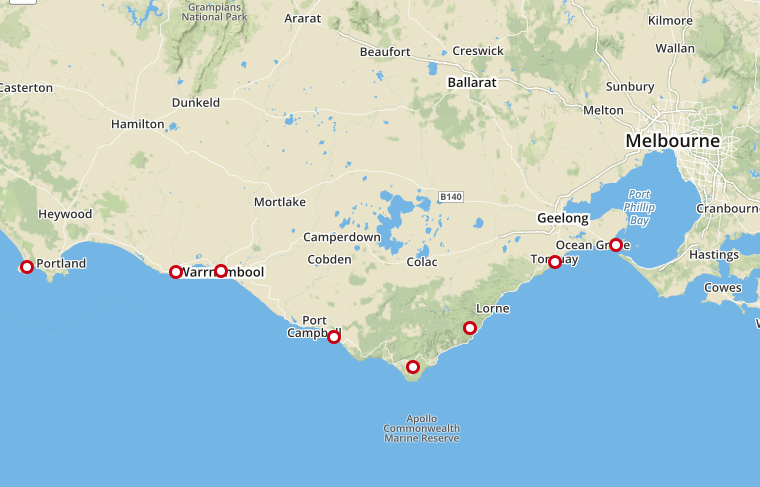 The route is clogged with busses disgorging multitudes of passengers at the most popular stops, especially the Apostles. 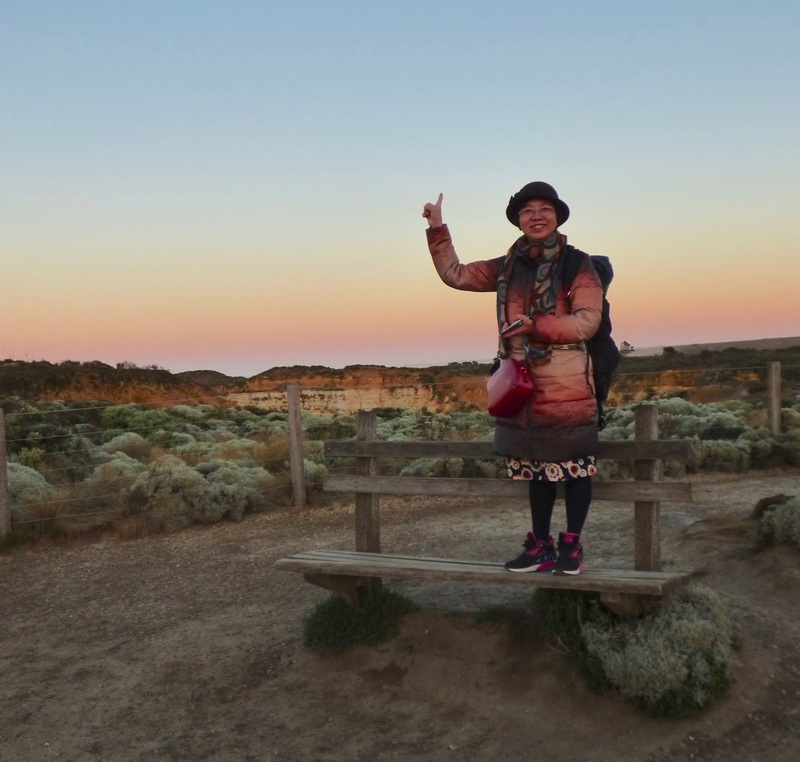 The only Asian tourist at Loch Ard Gorge, bundled up for dawn and happy to mug for the camera. 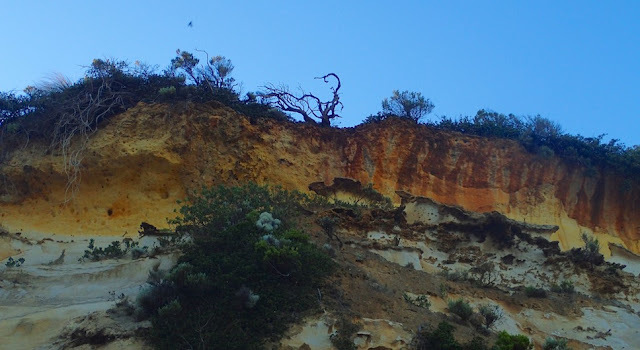 "Don't bother trying to get shots of the Apostles at sunset," warned Ozzie local Sally, when we chatted at some waterfalls near the Great Ocean road. "Last time I went there, a guy set up three big tripods in the best viewing area and wouldn't budge. He just kept moving between each one. Plus, there were all the others...."
Arch at Loch Ard Gorge, Great Ocean Road, Australia. Worse still, we discovered, were the rental vans, manned by folks who were clearly unused to driving faster than 60 km on the smooth, curvy highways with 80-110 km speed limits. Nor did they get the etiquette of pullouts or protocol of passing lanes. Loch Ard arch shining in the early sunrise glow. Great Ocean Road, Australia. We came across a brilliant cartoon that summed it up nicely. It showed a campervan wending its way through the hills. "Look at this pristine country!" the driver exclaimed. "And not a single car in sight!" The driver was followed closely by a dozen vehicles, hidden to him behind his pokey rig. "I call it Phyco Circus," was Andrew's opinion of The Great Ocean Road. 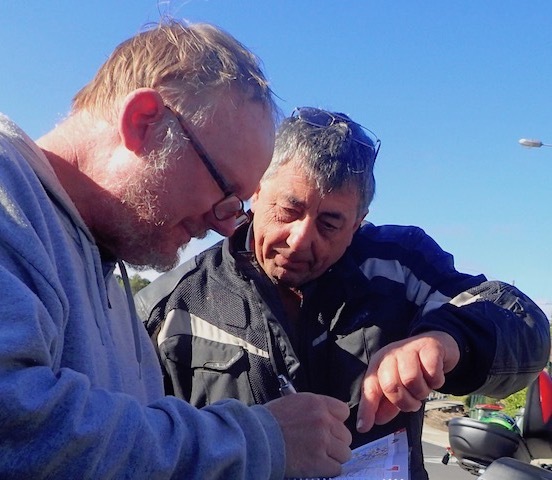 We met Andrew, another Ozzie local, in Laver Hill, just off the Great Ocean Road. It was early. Andrew was sipping a coffee when Wayne wrangled him for some local where-to-go advice. 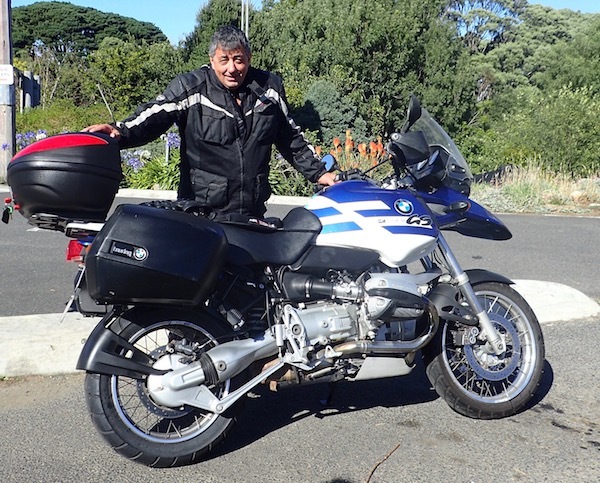 Posing upon request with his BMW motorcycle at Laver Hill. 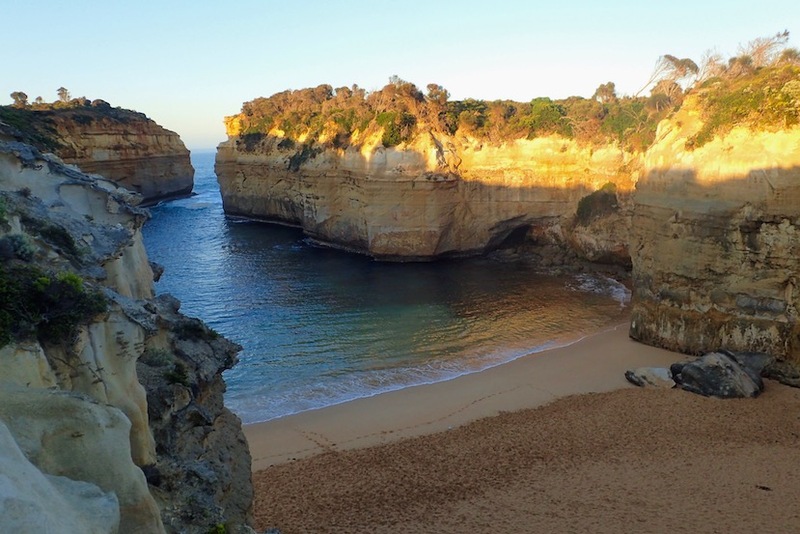 While the crowds drove the joy out of cruising great Ocean Road for Andrew, he recommended Loch Ard Gorge; said he liked it better than the 12 Apostles. Vibrant cliffs above Shipwreck Bay, Loch Ard Gorge, Great Ocean Road, Australia. Indeed, the crowds at the 12 Apostles sucked the much of joy out of what was otherwise a lovely series of scenic vistas. I quickly nixed my earlier notion of returning from our nearby Port Campbell digs for a sunset photo. It was pretty likely Sally's photo-zilla observation wasn't just some one-time exaggeration. 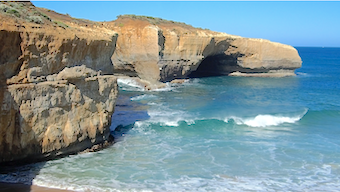 Stalagtites, Loch Ard Gorge, Great Ocean Road, Australia. Wayne brilliantly suggested since our Port Campbell hostel room was only a 15-minute drive from there, that we get up early enough in the morning to see it before the crowds arrived, and in time to make it back to our room and hit the showers before check out and hitting the road. Shipwreck Bay just after sunrise. If we were staying longer, this would’ve been a great place to spend the day on the beach and swim. 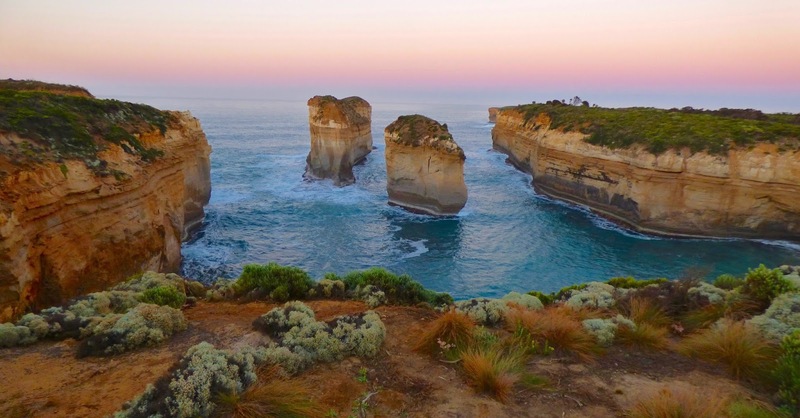 Great Ocean Road, Australia. The hostel was top-rated, and quite nice. The Grotto, overview, Great Ocean Road, South of Port Campbell. It was also $140 AUD -- that's over $100 USD, for a simple private room, but a shared bath (but far cheaper then $270 for the Best Western). Ok, linens (sheets and towels) were included, as was wifi and full access to the communal kitchen, but little else was free. You could gaze at the hostel's barista-made coffee for sale, while either imbibing in some free instant or doing what we did, making our own. 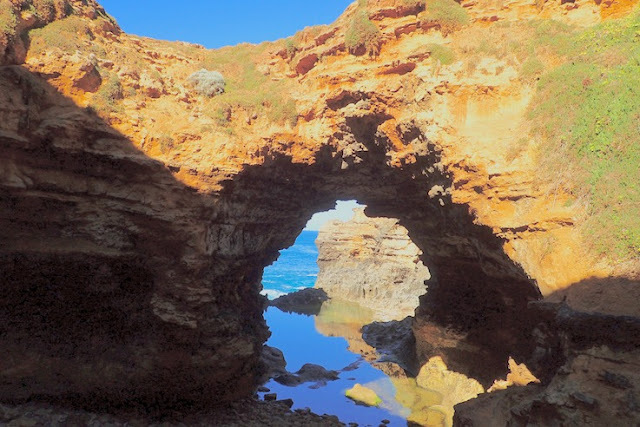 The arch to the see in The Grotto, Great Ocean Road, South of Port Campbell. I did have to wait for a couple to stop taking selfies first. We got up at 6:30. Hit the road by 7, and were at Loch Ard Gorge well before sunrise. And we had it nearly all to ourselves! London Bridge, mid-morning, not too crowded. 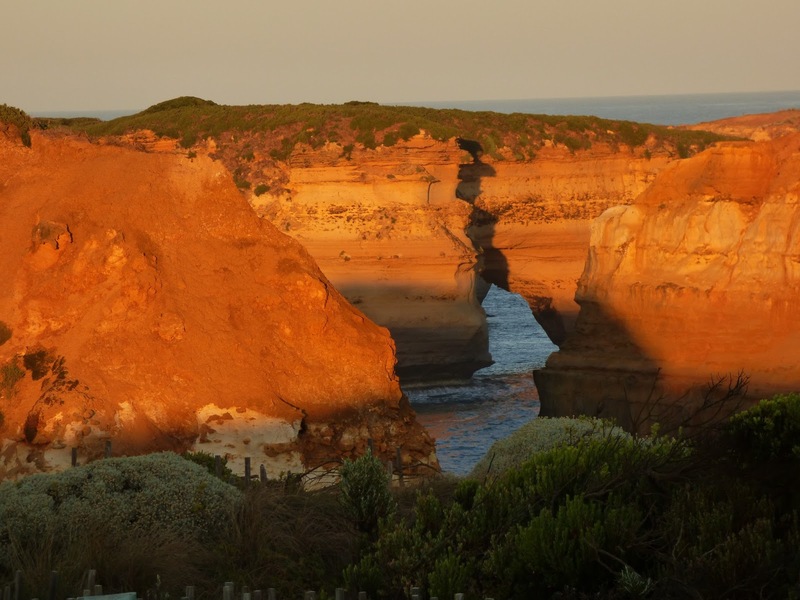 Great Ocean Road, South of Port Campbell. 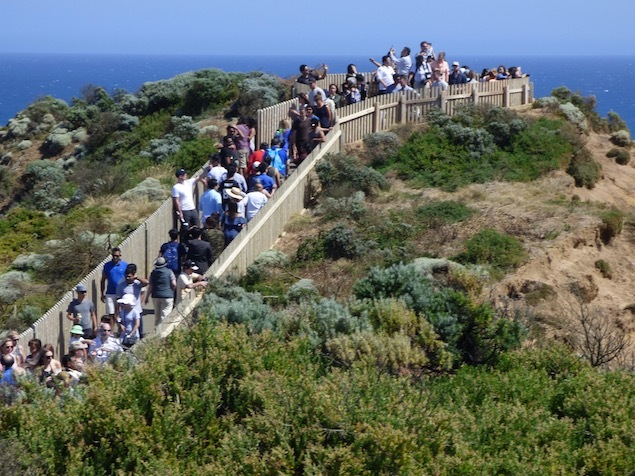 Bottom line -- Agony or ecstasy – should the Great Ocean Road crowds keep you away? Maybe it’s like pizza… even when it’s bad, it’s kinda still good. 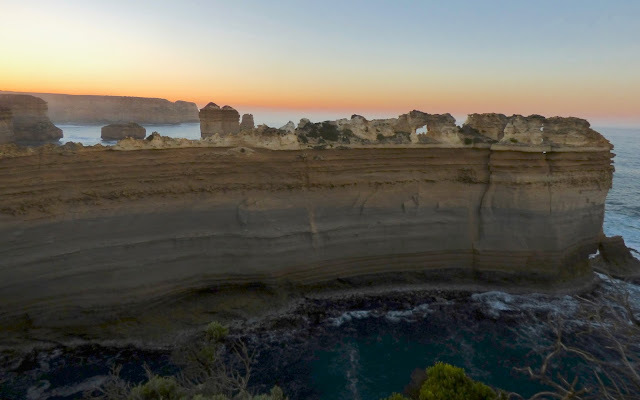 If you have the time to go, and can plan to be at a scenic spot in good weather before the sun comes up, the Great Ocean Road is positively magical. Great Ocean Road is good as or better than the promo pictures, and best captured by being there, whether your photos do it justice or not. Watching the waves roll through the gap at London Bridge. This post reflects the time we spent on the Great Ocean Road, February 24-27, 2017. At the moment, we're getting in some last minute wifi and topping off our gas tanks in Ceduna before we begin our trek across Australia's famed desolate Nullarbar Road. 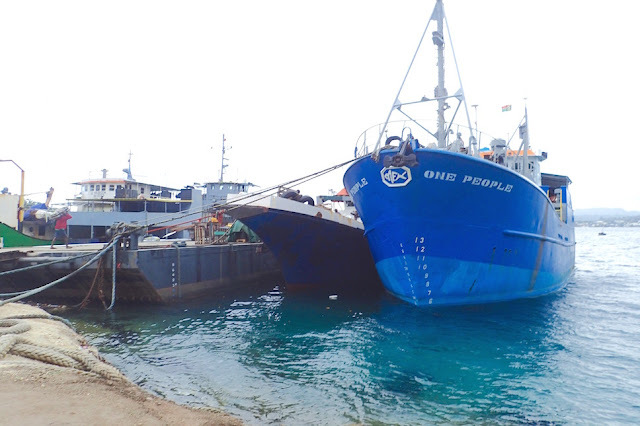 More catch-up and more on our circumnavigation across Australia's ocean of land. 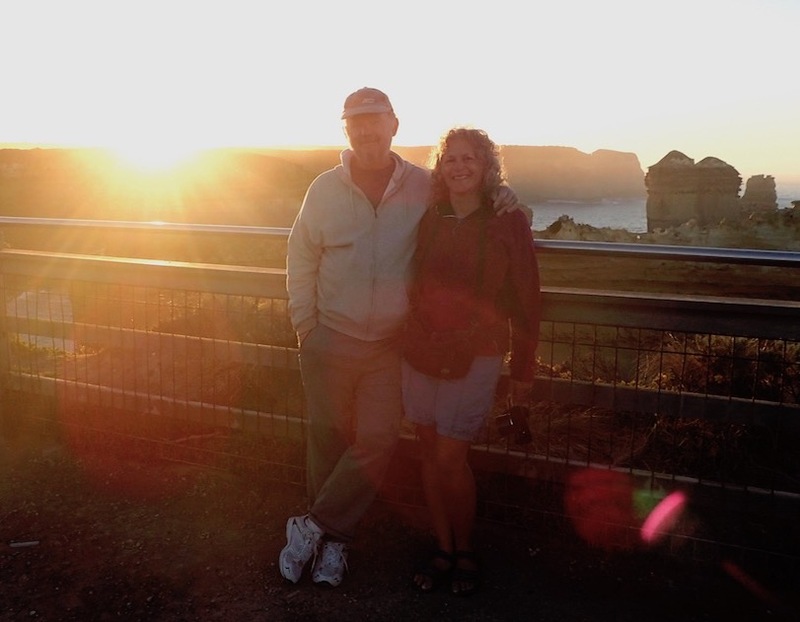 Wayne and Dana, bathed in the sunrise light over Loch Ard Gorge, Great Ocean Road, Australia.